Lizzie Mabbott is a prodigious cook and a prodigious eater! I’ve been following her cooking and eating exploits on the web for many years, first on the now-defunct BBC food discussion boards and since 2008 on her well-known blog, Hollowlegs. If she isn’t eating she may well be cooking, if she isn’t cooking she might be shopping for ingredients, and if she isn’t doing either of those things, there’s a good chance she’s pondering on what to eat or cook next! When I learned that she had secured a book deal I was not surprised in the slightest as her delicious personal twists on classic British, European, Chinese and other South East Asian dishes have long made many readers salivate, myself included. 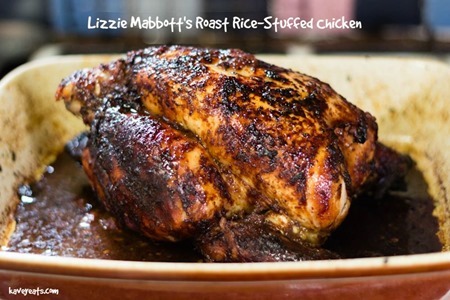 In Chinatown Kitchen she draws upon her amazing heritage; Lizzie is Anglo-Chinese, born in Hong Kong where she spent her formative years growing up not only on Chinese food but also exposed to the many cuisines of South East Asia. At 13 she was transplanted to England, where she has been ever since – albeit with some judicious globetrotting to feed those hollow legs! To describe the book as simply another tome on South East Asian cooking is to put it into a box that it doesn’t neatly fit into. It’s much more than Chinese – or even South East Asian – food made easy; rather it’s a very personal collection of recipes that represent Lizzie’s personal food story. There are classic Chinese and South East Asian dishes, sure, but there are also a fair few of Lizzie’s own inventions including some excellent mashups such as this Chinese Spag Bol recipe and an Udon Carbonara. Most recipes are illustrated with colourful and appealing photographs, styled but not overly fussy and with the focus firmly on the food. 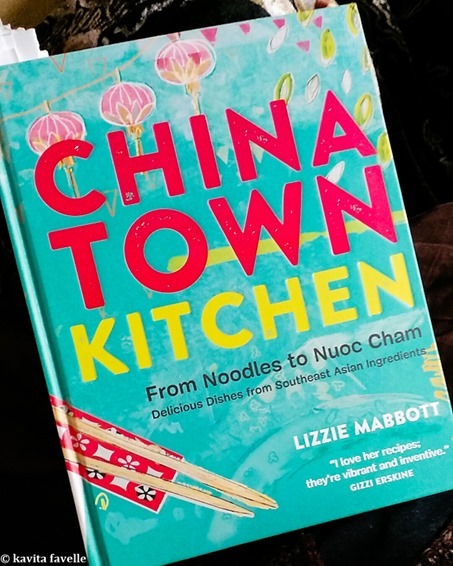 At the heart of the book is the idea of seeking out ingredients in the food shops of your nearest Chinatown – or indeed any oriental supermarkets or groceries you can find – and putting them to delicious use. To that end, the book is not just a set of recipes but also a shopping and ingredient guide. Add to that an introduction to key equipment and techniques and you are all set to get cooking. I tried hard not to bookmark every single recipe on my first pass, when trying to narrow down the list of what to make first. I ended up with 23 recipes bookmarked: Deep-Fried Whole Fish in Chilli, Bean Sauce, Japanese Spinach and Cucumber Salad, Grilled Aubergines with Nuoc Cham, Korean Rice Cakes with Chorizo and Greens, Sesame and Peanut Noodle Salad, Cabbage in Vinegar Sauce, Chinese Chive Breads, Griddled Teriyaki King Oyster Mushrooms, Banana Rotis, Poached Pears in Lemon Grass Syrup, Braised Egg Tofu with Pork and Aubergine, Spicy Peanut and Tofu Puff Salad, Fish Paste-Stuffed Aubergine, Mu Shu Pork, Steamed Egg Custard with Century and Salted Eggs, Cola Chicken Wings, Red-Braised Ox Cheek, Xinjiang Lamb Skewers, Red Bean Ice Lollies and Black Sesame Ice Cream with Black and White Sesame Honeycomb, plus the two I’ve already mentioned! So far, we’ve made two recipes, Chinese Spag Bol and Roast Rice-Stuffed Chicken. We’ve loved both and will certainly be working out way through the rest of my “short” list over coming weeks and months. As Lizzie explains, this recipe has little in common with the bastardised ragu we call Spag Bol in Britain – there are no tomatoes, nor red wine for a start – but it is made by simmering minced meat in a sauce and dressing noodles with the results. The predominant flavour comes from yellow bean sauce, with additional notes from soy sauce, hoisin and Shaoxing wine. Lizzie servies it with fresh vegetables and finely sliced omelette. Firstly, beat the eggs. Heat 1 tablespoon of the cooking oil in a wok, or a nonstick frying pan, until shimmering, add the beaten eggs and cook them over a medium heat until set to make a thin omelette. Remove to a plate and set to one side. Heat up the rest of the oil in the wok over a medium heat, add the spring onion whites, garlic and ginger and stir-fry until fragrant. Then add the minced pork, breaking up any clumps with your hands, and cook until browned. Add the yellow bean paste, soy sauces and hoi sin sauce with the water and Shaoxing rice wine and simmer for 30 minutes, stirring occasionally. If it’s looking a little dry, add a touch more water. Meanwhile, julienne the carrot and cucumber and set aside. Roll the omelette up and slice finely. Cook the noodles in a large saucepan of boiling water for a minute, then drain and place in a big serving bowl. Pour the meat sauce on top, then add the vegetables and omelette and stir to combine. Garnish with the greens of the spring onion and serve. The Roast Rice-Stuffed Chicken is a slightly more involved dish requiring the chicken to be marinated overnight (in a marinade that includes red fermented tofu and oyster sauce, amongst other ingredients) and the sticky rice filling to be made ahead ready to stuff inside the chicken before roasting. I made the wrong call to substitute a black sticky rice I had in my larder for the white sticky rice Lizzie’s recipe stipulates, and I’m sure that was the reason my mandarin peel and Chinese sausage-studded rice wasn’t sufficiently cooked through, but I do want try again with the right rice, as the flavours were fabulous. What’s more, the marinade on its own was super easy and amazingly delicious; even if we don’t have time to do the rice stuffing every time, I know the marinade will be used again and again. Chinatown Kitchen: From Noodles to Nuoc Cham is currently available on Amazon UK for £10 (RRP £20). Kavey Eats received a review copy from publisher Mitchell Beazley. Recipe text reproduced with permission from Mitchell Beazley. 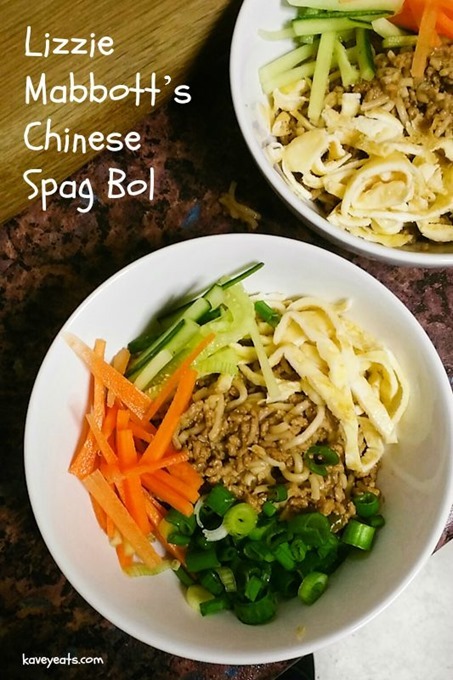 11 Comments to "Chinatown Kitchen | Lizzie Mabbott’s Chinese Spag Bol"
Glad the review was helpful, and yes, delicious dish. 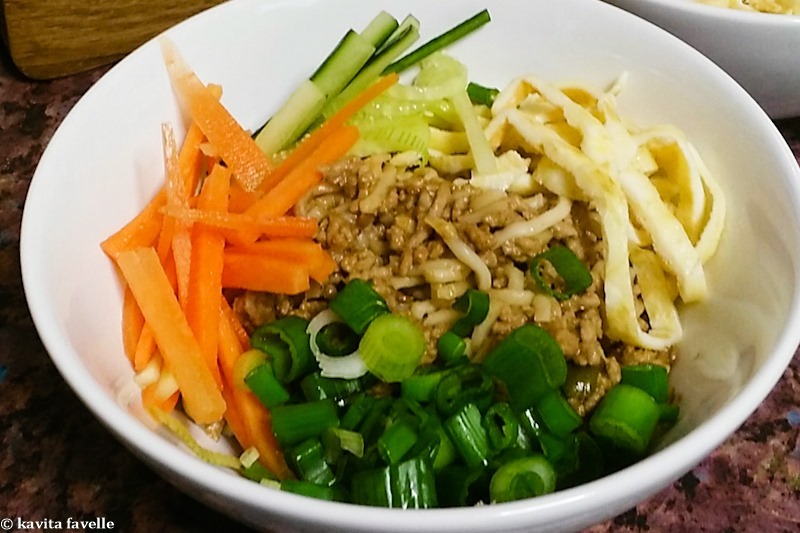 Of course, it’s a very Chinese mince meat dish, but it’s a clever twist for the name and a good reminder that there is so much similarity even in different cuisines. 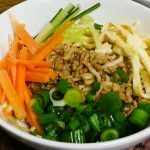 It’s still delicious without the egg and julienne vegetables so if you want to make it a slightly exotic but also still familiar plate, I’d say it would work very well! That looks like an interesting book, I’ll have to look out for it. I rather like bastardised spag bol (veggie of course), but this looks like a much fresher take on it. I could easily make it veggie. Thanks for sharing the recipe. There is so much flavour from the various ingredients that I think this would totally work with a veggie mince substitute — in some recipes I think the flavour from the meat mince / fat is important but here, I think you would still enjoy a veggie version very much! I have heard of the book but having now seen these recipes it is going to have to go on my Amazon wishlist right away. 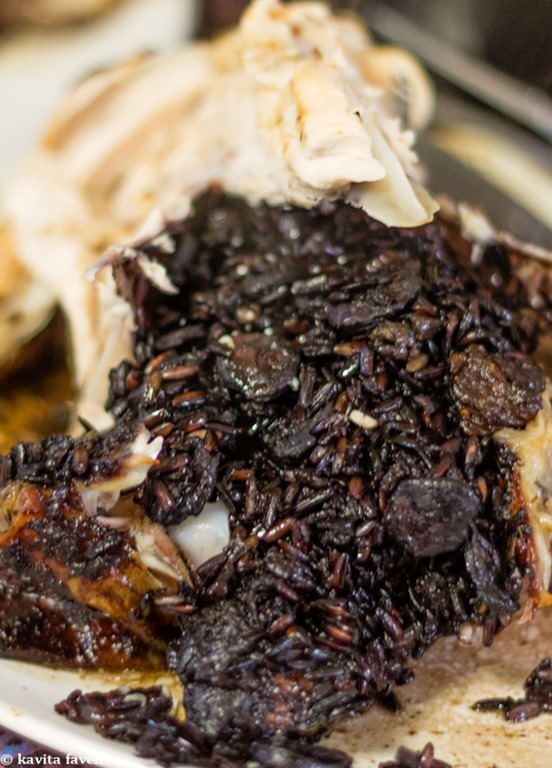 The rice-stuffed chicken looks amazing! thanks for the review, it is great to see some remakes of the recipes in a real life kitchen. Thanks Lucy, really glad to know the review has been useful. Hope you enjoy the book as much as we have. I know you’re not s’posed to judge a book by its cover, but this one would be straight in my basket based purely on the cover! I love shopping in my local oriental supermarkets, but often have no clue what a product is or how to use it (and unfortunately the young staff can never help either), so I’m guessing this would be a great place to start on learning about new flavours? I never tried Chinese food but I love it. This dish looks so tempting!